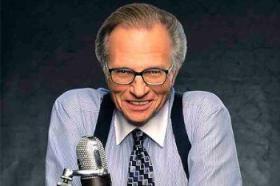 Larry King‘s CNN ratings have fallen significantly, especially recently. But the media-covering media have taken some serious and surprising shots at the TV news icon, writing the TV show obituary on King. That continues today with a New York Times column by David Carr – looking to put the nail in the coffin. Now there’s news a reality show judge may be slotted to take over for King (Piers Morgan). While the storyline of replacing a CNN mainstay is one that won’t go away anytime soon, it is CNN’s refusal to deny the speculation that keeps it in the news. Formulating an exit strategy for the program and the host is a task that falls on CNN/U.S. President Jon Klein and the rest of the network brass – and it certainly comes at an inopportune time. The network is faced with replacing the 8pmET prime time program, after Campbell Brown announced her exit as ratings remain low. Another hour of prime time is another serious decision – but it is one that must be dealt with. Still, a well-planned, lengthy retirement tour is not a foolproof solution. Just ask NBC, who spent five-years performing their Jay Leno dismount only to massively bungle the landing anyway. The ratings are low, though, and something must be done. Some of the blame deserves to go to CNN’s decision making – they went forward with airing King’s pre-taped Mick Jagger exclusive right in the middle of the most recent primary night. But in other ways, the trouble is self-inflicted – an hour-long exclusive interview with rapper T.I. is probably 45 minutes too long for both King’s audience and CNN as a whole. Or, as Carr writes, “On Thursday night, he took on BP’s Congressional testimony with four highly politicized commentators and failed to tame the lions. Each segment ended in unwatchable cross-talk.” Even King’s recent 25th anniversary celebration week of high-profile guests perfectly exemplified the program’s tone whiplash – Lady Gaga is not equal to Bill Gates is not equal to Pres. Obama, even if they all are BIG STARS! No one, likely not even CNN, will argue that King is a hardball, or even curveball, hurler – he’ll pitch it down the plate and let his guests do the rest. That doesn’t take away from his news-making ability, though (evidenced recently from a Laura Bush interview). But all signs point to this year being the last for the King of cable news, who had been dethroned years ago but remains in the same seat. And prematurely musing about his exit is no way to say goodbye – it’s something CNN needs to think about more than any other media outlet.